Summary. Aim: Development of carbon enterosorbents with optimal physical-chemical properties and high adsorptive capacity for their usage in the treatment of paraneoplastic syndrome and other endogenous intoxication in cancer patients. Methods: physical-chemical and biochemical methods of investigation. Results: In the work it has been shown that performance of additional steam activation on pilot plant developed in R.E. Kavetsky Institute of Experimental Pathology, Oncology and Radiobiology NAS of Ukraine, allows produce highly active granulated and fibrous carbon enterosorbents which possess well developed porous surface providing potent sorption potential toward compounds of hydrophilic and hydrophobic nature. Being placed in gastro-intestinal tract lumen these sorbents may cause certain effect on functional activity of detoxifying body systems and regeneration potential of many organs and tissues. Conclusion: The usage of carbon enterosorbents with optimal physical-chemical properties and high adsorptive capacity could be very perspective for correction of biochemical, immunologic, morphologic and hematological manifestations of paraneoplastic syndrome. Abbreviations used: ACFM — activated carbon fibrous material; BET — Brunauer — Emmet — Teller method; GIT — gastro-intestinal tract; HSA — human serum albumin; HSGD — HemoSorbent Granular Deliganding; IUPAC — International Union of Pure and Applied Chemistry; PNS — paraneoplastic syndrome; SCN — Synthetic Carbon Nitrogen-containing; VEGF — vascular endothelial growth factor. The growth of the majority of malignant neoplasia is accompanied by systemic action on an organism leading to the development of paraneoplastic syndrome (PNS) and other types of endogenous intoxications associated with tumor growth. PNS is generally specified as clinical laboratory manifestations caused not by local growth of primary or metastatic tumor but by unspecific reactions of different organs and systems, ectopic production of biologically active compounds by tumor such as growth factors, chemokines, cytokines, and proangiogenic biologically active mediators . Cytokines play a significant role in the development of cancer toxicosis and cancer cachexia syndrome. Among them the special place is occupied with vascular endothelial growth factor (VEGF) which reveals multiple physiologic and pathologic effects. It is thought that altered VEGF expression is among the causes of uncontrolled angiogenesis characteristic for a number of pathologic states including PNS . Picture of PNS is multiformed and could be promoted by dysfunction of many vital organs and systems related to effects of compression and tumor invasion what leads to disturbed homeostasis and development of metabolic intoxication. Apart from this, ligand overloading of cellular and humoral transport agents plus dysfunction of excretory-evacuation systems contribute to accumulation of toxic compounds in an organism of tumor bearer. Also, iatrogenic intoxication (i.e., intoxication caused by chemotherapy or radiotherapy, or surgical treatment and its complications) is of significant importance as well. The total endogenous intoxication syndrome which develops on such background in cancer patients possesses various clinical symptomatology and is determined by localization and distant character of influence of the tumor on metabolism and immune status of a patient. An intensity and multifactor character of endogenous intoxication in patients with malignant tumors necessitate introduction of potent detoxicating means into their treatment schemes for correction of metabolic consequences and decrease of systemic intoxication degree, including intoxications caused by performed anticancer chemo- and radiotherapy. Enterosorption is an effective method of correction of PNS symptoms and other components of endo­genous intoxication in cancer patients. Perspectiveness of enterosorbents use is grounded on their distant (extraenteric) action which is manifested by altered biochemical parameters in organs and tissues distant from gastro-intestinal tract (GIT) . It is known that the most important distant effects of enterosorption are antioxidant, hepatoprotective, myeoloprotective, and immunomodifying ones. The presence of carbon adsorbents in GIT lumen results in significant norma­lization of cytokine profile, parameters of humoral and cellular immunity, indexes of endothelial dysfunction, favors to mitigation of myelodepression degree, increases functional activity of detoxicating systems, positively affects structural-morphologic indexes and regeneration potential of many organs and tissues . While selecting enterosorbents for PNS therapy, one should pay special attention to optimization of their sorption properties and textural characteristics. Development of porous structure and sorption surface of activated carbon materials allows receive unspecific sorbents with high sorption power toward a wide spectrum of metabolites and toxins of hydrophilic, hydrophobic and amphiphylic nature including these tightly bound with proteins and cell membranes, which reflect multifactor nature of endogenous intoxication in cancer patients. The aim of present study was the development of production technology of microgranulated carbon deliganding sorbents and powdered carbons with optimized properties and the research of their sorption potential toward a number of marker compounds of various chemical nature. An achievement of such aim will allow consider them as enterosorbents for decrudescence of biochemical, immunologic, morphologic, and hematologic manifestations of endogenous intoxication in oncologic clinic, including PNS symptomatology. In the work the following dyes were used: congo red, methyl orange, phenol red, methyl red, methylne blue; and also vitamin В12, creatinine and bilirubin (Sigma, USA), 10% human serum albumin (HSA) solution for intravenous injection (Kyiv Municipal Center of Blood), and preparation of doxorubicin (Ebewe, Austria). All other reagents were of high purification grade. Evaluation of sorption properties of carbon sorbents toward dyes, vitamin В12 and creatinine has been performed at batch mode experiments. Sample of sorbent (10 mg) was placed into the contact with 12 ml of adsorbate solution, exposure period was 240 min. Final concentration of the dyes methyl orange, congo red, phenol red, vitamin В12 and creatinine was determined by spectrophotometry using calibration curves plotted at wave lengths of 431; 477; 430; 360, and 234 nm respectively. 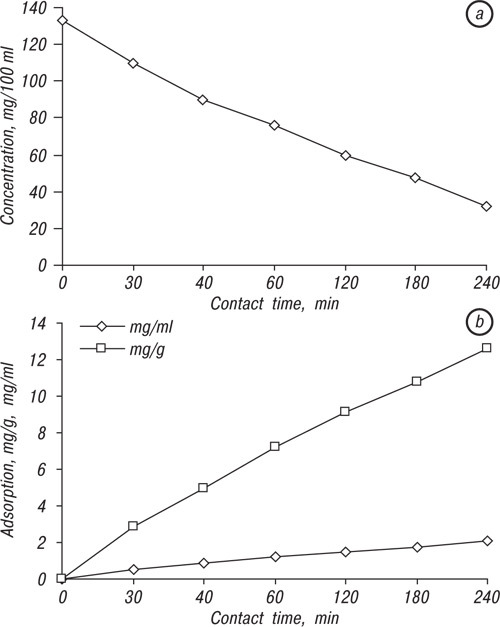 For evaluation of sorption potential of enterosorbents toward HSA and representatives of protein-bound compounds, namely, unconjugated bilirubin and anticancer preparation doxorubicin, there have been performed expreriments where 10 mg of stu­died sample were immersed into 6 ml 3% HSA solution or in 6 ml of bilirubin or doxorubicin solution. Contact period at batch mode was 240 min, rpm=100. Final concentration of albumin and unconjugated bilirubin was determined with the use of test kits Protein (Total) (BioSystems reagents & Instruments, Barcelona, Spain) and Bilirubin S (PLIVA-Lachema Diagnostika s.r.o., Brno, Czech Republic) respectively. Concentration of doxorubicin before and after the contact with sorbent was determined by spectrophotometry at the wave length of 488 nm. An impact of microporous structures was calculated by Dubinin — Radushkevich model, pore distribution by sizes — by Dubinin — Astakhov model, mesopore area — by the method proposed by Burrett, Joyner and Halenda [5–7]. In the study of sorption characteristics of the samples of activated carbons we have use methodical recommendations “Preclinical study of enterosorbents” developed in Department of Physico-Chemical Mechanisms of Sorption Detoxication of R.E. Kavetsky Institute of Experimental Pathology, Oncology and Radiobiology, NAS of Ukraine and approved on the session of Scientific-Expertise Council of Ministry of Health of Ukraine, protocol № 9 from 28.10.2010. Statistical analysis of data was performed using Statistical 10.0 soft ware. 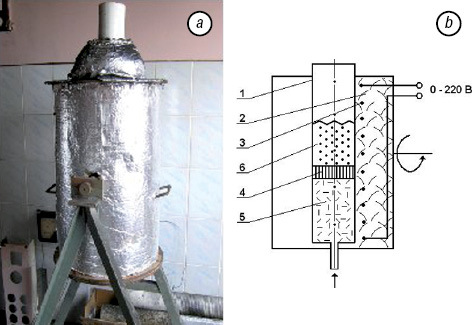 The samples of carbon sorbents of globular granulation underwent thermochemical processing in electric-heated shaft furnaces of different productivity (Fig. 1). In reaction zone the material was present in pseudoliquified layer. Water vapour, carbon dioxide, nitrogen and their combinations served as pseudoliquifying agents. The main element of the plant for performance of additional high-temperature steamgas activation of carbon sorbents is quartzous or ceramic reactor (Fig.1 b (1)) placed in a heat-insulated metal case (2). Reactor is heated with fechral coil (3). Current on the coil is supplied through voltage regulator. Plant construction allows maintain temperature in reaction zone up to 1100 °С. Ceramic porous gas-distributing plate (4) divides reactor in underplate zone (5) and reaction zone (6). Saturated water wapour from steam-generator (or compressed gas from balloon through pressure regulator) is passed into underplate zone where in contact with glowing ceramic a filling material is overheated. Through gas-distributing plate pores an overheated gas is passed steady into zone (6) where it participates in activation reaction. The work material is loaded through the upper part of the reactor and is activated at the state of pseudoliquization. Tempera­ture in different plant zones is measured with chromel alumel thermocouple. Steamgas activa­ting agent consumption depends on a density of the work material and is regulated as well. Exit gases are after-burned in air atmosphere at outlet from the reactor. Sampling of the work material is done with special sampler. When required parameters of the materials are achieved, it is outloaded by rolling of reactor tank. Two samples of sorbents of globular granulation of SCN and HSGD marks which underwent thermoche­mical processing in boiling layer plant, and possessing average bulk density of 0.30 and 0.19 g/cm3, respectively, were separated in 3 fractions the main physico-chemical characteristics of which are presented in Table 1. On sorbometric Quantachrome Аutosorb-iQ-МР station there has been performed the series of study of these sorbents. The samples were degasified for 3 h at temperature 300 °C for removal of gases which are absorbed by sorbent from air. After degasifying, unit with the sample was placed in measuring station which is composed from a comparison unit and detector of nitrogen level. The system was vacuumized and cleared with helium. Measuring station was placed in liquid nitrogen. All measurements were performed at temperature 77.35 °К (-195.8 °C). To determine total surface area, nitrogen has been used, i.e. in the case of its use no local sorption and no performance of gas as two-sized is observed. There the measured value is the gas pressure in the unit with the sample. To study specific surface of carbon sorbents, pore vo­lume and their distribution dependent on radius, total isotherm of adsorption for all samples was documented, then the research series of initial region of isotherm (0–0.35) of the sample was performed to achieve reproducibility of results. Large specific surface obtained on total isotherm, means a capture and containment of gases from air medium which due to the presence of large quantity of micropores could remain even after degasification. By isotherm character one could conclude on surface area, porosity of adsorbing body and character of interaction between adsorbent and adsorbate. These total isotherms were curved with respect to р/р0 axis, on each isotherm there was present nearly horizontal plateau which carries a sharp ascent in approximation to axis р/р0=1. Isotherms of such type are characteristic mainly to microporous samples. Due to an absence of a unified theory of adsorption, for data counting there has been used a number of the most commonly used methods. Brunauer — Emmet — Teller (BET) method is widely used for determination of specific area with porous structure of high-disperse solid bodies or systems with developed porosity. Specific area by type I isotherm to which the obtained curves were related, could be counted by Langmuir equation. This equation is a special case of BET equation, it is represented by line in coordinates (p/p0)/W from p/p0 and describes monolayer adsorption. Upward bias of data by Langmuir points on the adsorption deviation degree from monolayer model. By slope of line one could calculate monolayer weight (Wm) and special surface area. As it is shown in Table 2, all three sorbents HSGD-1, HSGD-2 and HSGD-3 possess larger special surface area compared to SCN carbons in which adsorption constant was more than 3 fold higher than that in HSGD. Pore classification accepted by International Union of Pure and Applied Chemistry (IUPAC), is based on the following principle: each pore sizes interval responds to characteristic adsorption properties which are reflected in isotherm types. The margin between different classes is not strictly determined because it depends on the ascorbate form and nature (especially of polarizability). In micropores, due to pore walls proximity, potential of interaction with adsorbed molecules is significantly higher than in more wide pores, and upon relatively equal pressure an adsorption value is also bigger. In mesopores capillary condensation takes place, and on isotherm a characteristic hysteresis looping is observed. Dia­meter of macropores responds to the pressure near р/р0 = 1, that’s why a possibility of determination of macropores diameter depends on pressure measurement accuracy at this range. It’s necessary to note that BET model doesn’t rely on impact of micro- and mesopores, and their impact into total specific surface area (Ssp) is substantially additive one. Data on mesopores (Table 3) evidence on well development of mesopores in the structure of sorbent and consequently on fine transport of adsorbed compounds to micropores what provides high effectiveness of this group of sorbents. Notes: 1Vmicro — average volume of micropores by Dubinin — Radushkevich; Smicro, m2/g — surface ara of micropores by Dubinin — Radushkevich; 2Vmicro — average volume of micropores by Dubinin — Astakhov; Rpore — average radius of micropores by Dubinin — Astakhov; Vpore — average volume of micropores by Barrett — Joyner — Halenda; R — average radius of micropores by Barrett — Joyner — Halenda. In total, we have obtained a significant data base which describes structure characteristics of studied sorbents quantitatively and qualitatively. Fig. 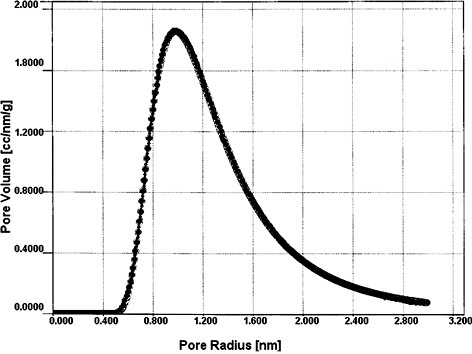 2 presents the curve of pore distribution by radius by the example of granulated HSGD-2 sorbent, and shows that the prevailing pore radius on its surface is 0.98 nm. 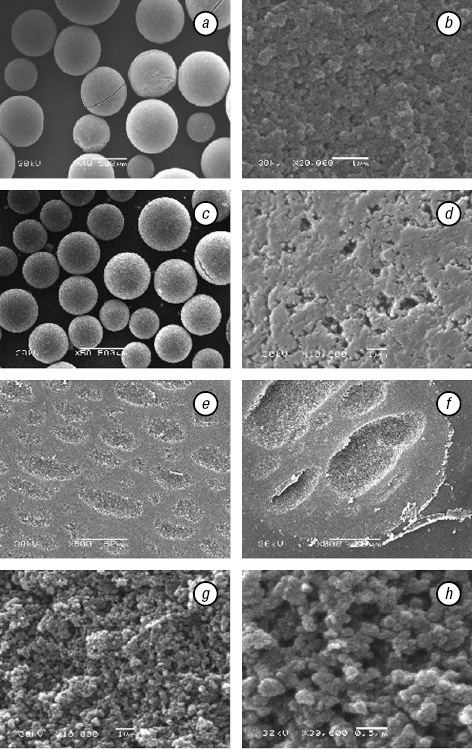 The presence of well developed porous external surface with multiple fractures, caverns, extensions, macropores and micropores has been evidenced by the method of electron microscopy in activated SCN and HSGD carbons (Fig. 3 a–d). The picture of cross-section of HSGD granule was very interesting (Fig. 3 e, f). One could see that the section surface is speckled with cavities-“craters”, the presence of which is a characteristic pattern of HSGD sorbents. At larger magnification it could be seen that the surface inside the cavities contains multiplicity of pores and sections of different space configuration (Fig. 3 g, h). As one could see from Table 4, HSGD-2 sample possesses the highest sorption potential toward water-soluble compounds of low molecular weight, in particular: anionic dyes (congo red, methyl orange), cationic dye methylene blue, and phenol red (neutral at physio­logic pH values), and also metabolite of hydrophylic nature — creatinine, and representative of medium molecular weight compounds — vitamin В12. Fig. 4 shows the data on adsorption of HSA by HSGD-2 sorbent. 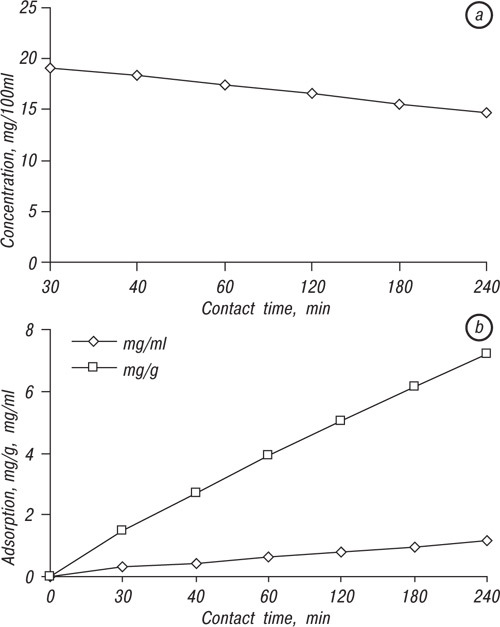 It could be seen that during 4 h contact with protein solution 1 g of this sorbent sample is capable to adsorb approximately 500 mg of protein, and each hour of contact yields adsorption value at average by 12.7%. 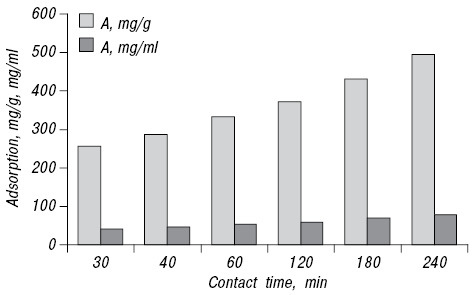 If expressed in volume units, this result could be presented as follows: in 4 h contact period 1 cm3 of HSGD-2 is capable to adsorb nearly 80 mg of albumin. The results on adsorption of unconjugated bilirubin from 3% albumin solution were interesting. This pigment is related to the class of hydrophobic compounds strongly bound with proteins-transporters. The bond in bilirubin-albumin complexes is strong enough what is evidenced by their high association constant Кass = 9,5 × 107/Mole, that’s why for bilirubin removal the sorbents with potent sorption potential are required. In Fig. 5 a, there is shown the change of unconjugated bilirubin content dependent on contact time with HSGD-2 sorbent — it decreased steadily from 20 g/100 ml to 15 mg/100 ml in 4 h period. Along with this adsorption value recalculated per unit of weight or volume of HSGD-3 was 7.2 mg/g and 1.15 mg/cm3 respectively. It’s necessary to note that after 4 h contact molar ratio bilirubin/albumin decreased from 0.89 to 0.76. It means that during the contact not only the sorption of albumin/bilirubin complexes occurs, but also the detachment of bilirubin from protein molecule occurs as well what evidences on high sorption activity of this granulated sorbent. In regard to the data on doxorubicin adsorption (Fig. 6), one should note that after 4 h of contact with the sorbent, concentraton of this anticancer drug decreased from 133.0 to 32.3 mcg/ml, and adsorption value recalculated per HSGD-2 units of weight and volume was 12.58 mg/g and 2.05 mg/cm3 respectively. It’s necessary to note that after 4 h contact with the sorbent molar ratio of doxorubicin/albumin has decreased from 0.503 to 0.15, i.e. approximately 3.35 fold. Also, there have been received interesting results in experiments with powdered carbon ZL (China) and fibrous carbon material ACFM produced by grinding (Brovary, Ukraine). These sorbents as well as granulated ones possess well developed external porous surface (Fig. 7 a–b (powder ZL), c–d (gritted fibrous material ACFM) and sufficiently high sorption activity (Table 5). From Table 5 one could see that gritted fibrous material ACFM possesses higher sorption activity toward dyes-markers compared to powder ZL, and also toward vitamin В12 and unconjugated bilirubin. 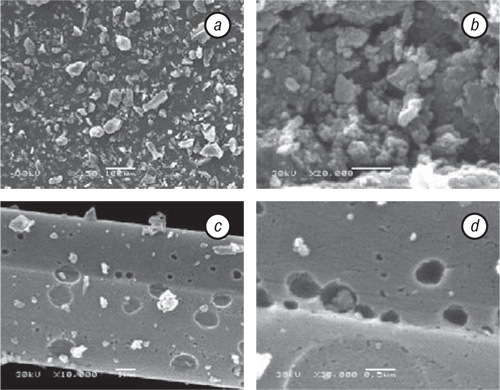 So, in this work it has been shown that granulated sorbents of HSGD mark with the size of granules of 0.25 < m < 0.38 cm and gritted fibers of carbon material ACFM possess well developed surface area providing their potent sorption ability toward a number of hydrophilic and hydrophobic compounds. Being placed in GIT lumen and possessing high adsoption activity, these sorbents may positively affect an activity of detoxifying body systems and regeneration potential of many organs and tissues; this could be very perspective for correction of manifestations of PNS and other endogenous intoxications in cancer patients. This study has been supported by fundamental complex program of scientific research of Division of Biochemistry, Physiology and Molecular Biology NAS of Ukraine “Functional genomics and metabolomics in system biology» in the frame of scientific project “Molecular-genentic mechanisms of paraneoplastic syndrome formation associated with tumor angiogenesis, and possible approaches for correction of pathologic alterations” (№ 0112U002196). 1. Bereznaya NM, Chekhun VF. Immunology of Malignant Growth. Kyiv: Naukova Dumka, 2005. 790 p. (In Russian). 2. Solyanik GI. Cellular and molecular mechanisms of cancer cell metastasis. “Oncology (selected lectures for students and physicians)”. VF Chekhun (eds). Kyiv: Zdorovya Ukrainy, 2010: 267–82 (In Ukrainian). 3. Nikolaev VG. Method of hemocarboperfusion in experiment and clinic. Kyiv: Naukova Dumka, 1984. 360 p. (In Russian). 4. Nikolaev VG, Sakhno LO. Possibilities of modern sorption therapy in oncology. Clin Oncologiya 2011; Special issue II: 220 (In Ukrainian). 5. Krasnova ТА, Belyaeva OV. Interaction of pyridine with the surface of active carbons. Zh Phys Khimii 2011; 85: 536–41 (In Russian). 6. Dubinin ММ, Astakhov VF. Adsorption on microporius sorbents. Izvetstiya AS USSR: Ser. Chemistry 1971; 1: 5–16 (In Russian). 7. Kawashima A, Katayama M, Matsumoto N, et al. Physicochemical characteristics of carbonaceous adsorbent for dioxin-like polychlorinated biphenyl adsorption. Chemosphere 2011; 83: 823–30.